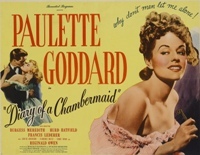 A woman gets a job as a chambermaid in a house in the French countryside. She wants to better herself and attracts the son of the family, the older gentleman next door and is intrigued by the enigmatic family valet. Paulette Goddard does what she can with the character, but this is over shadowed by the film not really knowing what it is. It moves between romantic comedy, social comment and class differences, but falls between all three.